Your 403bCompare.com account does not interact with any of your other CalSTRS accounts. Use the steps below as a start-to-finish guide to choosing the most appropriate 403(b) product for your retirement savings needs. Sign in to your account to ensure your progress is saved. To sign in, select the Sign In button located at the top right of this page. Don't have an account? Registering is easy. Select the Register button located at the top right of this page. Ensures that you are comparing vendors and products approved by your employer. Select the Find Employer button on the right to search for your employer. Review your employer’s plan details. Select the Set as Employer button on your employer’s page. 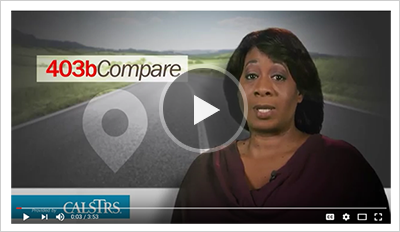 Select the Compare Products button to the right to start comparing. Compare the fees, features and services of the available 403(b)s.
Select the Set as My Product button associated with any product to find out how to enroll and contribute. Follow steps 3a and 3b to enroll and start contributing to your selected 403(b) product. Use the following contact information for questions regarding enrollment. View the vendor Contact Information for a list of office locations. You must first select an employer and product to view enrollment information.